The Wolfpack Wrestling Club is a non‐profit sports organization committed to the improvement of athletic and personal growth through the sport of wrestling by fostering an environment mentorship and resources reach the youth, collegiate, and senior level athletes aspiring to become NCAA, World, and Olympic Champions as well as leaders of the community. The Wolfpack Wrestling Club operates as a 501(c)(3) charitable organization powered by donors, sponsors, and supporters both locally and nationally who share a common interest in the growth and preservation of the sport of wrestling. Provide our youth with a positive experience in amateur wrestling in a competitive and fun environment, to help them become successful athletes, students, and people. Teach our wrestlers valuable skills important in life such as good sportsmanship, teamwork, discipline, work-ethic, self-motivation, and confidence to be champions in all they do. Enhance the overall fitness level and develop the wrestling skills of all our wrestlers, from our first-year wrestlers to our most experienced wrestlers. Encourage good sportsmanship and pride in our team. Provide a fun environment that challenges our wrestlers to be the best in all they do. Positively influence character development by emphasizing good habits and attitudes. Enhance the overall fitness levels of our youth by developing their strength, agility, flexibility, balance, and wrestling skills. Foster a sense of personal achievement by helping wrestlers set goals and work towards meeting those goals. Prepare our wrestlers to become more competitive as they mature, and provide them the skills to succeed on the local, state, national, and world level. Provide qualified adult leadership and a safe and healthy environment. Provide coaches who have been successful at state, national, and international levels to develop wrestlers of all ages. Provide an atmosphere that encourages parent/family involvement in our club. Be Champions in all that we do! The Wolfpack RTC's goal is to support multiple senior level athletes as they compete on the international wrestling circuit during the current Olympic cycle (2016-2020). Additionally, our organization provides world class training opportunities for elite developmental athletes from the Research Triangle area while also making a playing an active role in both our local communities and the greater North Carolina wrestling community. Obenson Blanc joined the Wolfpack staff in the summer of 2014 after the conclusion of a successful freestyle career which included five U.S. National Teams from 2009 to 2013. Blanc was a double Champion at the U.S. World Team Trials and U.S. Open Championships in 2010 and 2013. Since 2014, Blanc has helped mentored 2 NCAA Champions, 10 All-Americans, and 10 ACC Champions as has been a part of NC State’s rocket ascension to wrestling prominence which includes the 2016 ACC team championships, #2 ranking in 2016, four All-Americans in Tariq Wilson -3rd, Kevin Jack- 6th, Hayden Hidlay -2nd, Michael Macchiavello-1st, and the highest NCAA tournament finish during the 2018 season when Pack wrestling took home the 4th place trophy. Blanc officially took over the RTC responsibilities fall of 2017 and during the 2018 season has helped all members of the Wolfpack Regional Training qualify for the World Team Trials Challenge tournament and has produced 4 world team members: Nick Gwiazdowski, Michael Macchiavello (U23), Hayden Hidlay (U23), and Sean Fausz (U23). Blanc himself was an NCAA All-American for Lock Haven University of Pennsylvania. Blanc finished his collegiate career at Oklahoma State University where he qualified for his fourth NCAA tournament falling one win shy of repeating All-American honors. Internationally, Blanc represented the United States in various competitions including the 2010 World Championships in Moscow finishing top-10 in the world at 55kg, Pan American Championships where Blanc was a finalist (2009, 2010, 2012), 2013 World Cup where the United States finished with a bronze medal, champion at the Ziolkowski Memorial in Poland, as well as an alternate for the 2012 Olympic Games in London at 55kg. Popolizio took the helm of the NC State on April 10, 2012 and has pushed NC State Wrestling towards its highest accomplished at a very rapid pace. Popolizio’s philosophy and unwavering commitment towards a culture of excellence has helped NC State Wrestling experience its most successful season to date as the Wolfpack brought home its first-ever team trophy finishing a school and ACC-best fourth at the 2018 NCAA Championships in Cleveland, Ohio. R-Sr. Michael Macchiavello won a national title at 197 pounds, and R-Fr. Hayden Hidlay placed second at 157 pounds. The Wolfpack also had a school record four All-Americans with R-Fr. Tariq Wilson placing third and Sr. Kevin Jack taking sixth. NC State became the first ACC school with two NCAA Finalists under Popolizio’s leadership. Popolizio was named the 2018 Dan Gable co-NCAA Coach of the Year, 2018 ACC Coach of the Year, and was also named the 2016 National Coach of the Year by FloWrestling. Over the last five seasons, NC State has had three national champions and four of the last five ACC Wrestlers of the Year. Overall, Popolizio has led NC State to five straight top-20 finishes at the NCAA Championships with 3 individual NCAA Champions, 11 All-Americans, 11 ACC Champions, 1 ACC Tournament Championship, 1 ACC Dual Championship, and have won 50 of the last 55 dual meets. Prior to NC State, in six seasons at Binghamton University (2007-12), Popolizio transformed the Bearcats into a national contender after inheriting the program that went 0-12 following its reinstatement in 2005-06. Among his highlights includes 4 NCAA All-Americans, 21 NCAA qualifiers, a CAA Conference title, and finishing 14th at the NCAA Championships. Prior to his stint at Binghamton, Popolizio was the lead assistant and recruiter at American University for two seasons, helping that program finish 17th in the country. Popolizio coached seven NCAA qualifiers and the school’s first All-American. Prior to that, he served as an assistant coach at Army (2003-04) and Sacred Heart (2002-03). Athletically, Popolizio was a decorated wrestler during his student-athlete career for Oklahoma State. Among his highlights during his collegiate career included being ranked as high as the No. 1 nationally at 184 lbs during his senior season, three-time NCAA qualifier, and helped lead Oklahoma State to Top 5 national finish (second, third, third and fifth) at NCAA Championships in each of his four seasons with the Cowboys. 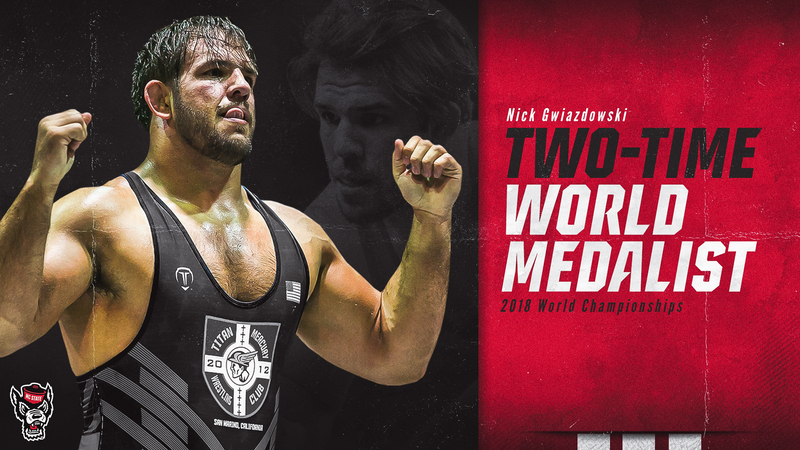 Popolizio was a Big 12 finalist twice in his career and has finished as high as Fifth at the World Team Trials in 2003. Adam Hall joined the NC State coaching staff in the summer of 2015 as an assistant coach. In just his first season with the Wolfpack, Hall helped NC State to one of its best seasons in 2015-16. NC State won the 2016 ACC Championship, the first at NC State since 2007. Four individuals were crowned conference champions, and six made it to the finals overall. NC State finished in 11th place at the NCAA Championships, the best finish since a school-best seventh in 1993 at the time. The Pack tied the school record with three All-Americans in 2016: Tommy Gantt (5th - 157), Pete Renda (3rd - 184) and Nick Gwiazdowski (2nd - 285). During the 2015-16 year, Hall himself placed fifth in both the U.S. Olympic Trials Qualifying Tournament and the U.S. Olympic Trials. In addition, he won his weight class (70 kg) at the University National Tournament to represent Team USA at the 2016 University World Championships. Donnie Vinson joined the NC State coaching staff in 2016 as an assistant coach. Vinson was an All-American at 149 pounds during his collegiate career at Binghamton University under Coach Pat Popolizio. Vinson started his coaching on staff at Cornell where he helped tutor three NCAA champions and two runners-up and 11 total All-Americans. Vinson is the career wins leader at Binghamton with a 132-27 record and was a two-time Colonial Athletic Association Wrestler of the Year. A 2012 All-American at 149 pounds, Vinson was named the CAA Championship’s Most Outstanding Wrestler as a senior and claimed the athletic department’s Athlete of the Year award. He was also chosen to receive the John Bilos Alumni Award, given to the top senior male for outstanding career performances as a Bearcat. Vinson is one of just four wrestlers to defeat Kyle Dake, Cornell’s four-time NCAA champion, during his collegiate career. Coach Bernstein grew up in Rockville, Maryland, and where he started wrestling at the age of eight with The Wheaton Boys Club. Bernstein wrestled in high school at The Bullis School in Potomac, MD where he went undefeated in 110-0. Bernstein won three National Prep School Championships while and was named a First Team All-American by Amateur Wrestling News at 138 lbs in 1984. In Freestyle, Bernstein won two more AAU National Championships, The Cadet World Championships in 1982, and The Junior World Championships in 1984 representing Team USA. Bernstein earned a full scholarship to The University of North Carolina at Chapel Hill, where he won two ACC Championships (1986, 1987) and placed 4th at the 1987 NCAA Championships, earning All-American honors. In 1990, Coach Bernstein began his coaching career as the assistant wrestling coach at The University of Virginia. Three years later, Bernstein was offered the head coaching job at UVA. Bernstein went on to coach 25 ACC Champions and six All-Americans. During his 13 year tenure, Coach Bernstein accrued over 100 wins and led UVA to two regular season ACC Championships and three top 25 finishes at the NCAA Championships. Bernstein was named VA coach of the year several times and mentored four assistant coaches who went on to become Division I head coaches. Bernstein founded the Cavalier Wrestling Club, which catered to all levels of wrestling from elementary age to Olympic level training as well as The Central VA Wrestling League. Currently, Coach Bernstein is the President of the Wrestlers in Business Network (Triangle, NC Chapter) as well as being the coach of the Wolfpack Wrestling Club. Coach Cesari grew up in Northeastern Pennsylvania and started wrestling at the age of six, and has been involved in the sport of wrestling for over 46 years as a wrestler, coach, referee, and parent of a wrestler. Cesari wrestled in high school for his father, Joe Cesari Sr., at North Schuylkill High School , one of the most successful wrestling programs in Pennsylvania history. While at North Schuylkill, Cesari was a 3x PA State Champion and 2x State Tournament Outstanding Wrestler. His record was 154-5-1 with 103 pins, and in 1984 he was named to the First Team High School All-American Team as well as a World Schoolboy and National AAU Freestyle Wrestling Champion. Cesari earned a full scholarship to wrestle at North Carolina State University, where he was a 4-year starter. Cesari was a 1988 ACC Champion, a 3x NCAA Tournament qualifier, and an NCAA tournament top-12 finisher. In 1989, Cesari received the NC State ACC Senior Merit award for achievement in academics and athletics. Coach Cesari currently works as a department director at Duke Health, and stays involved in wrestling as a volunteer youth and high school coach, and as a high school and NCAA wrestling official. In 2006, he was inducted into the Pennsylvania Sports Hall of Fame. Coach Rodriguez grew up in Northern New Jersey, where he started wrestling in his freshman year of high school, and has been involved in the sport as a collegiate athlete, coach and parent for over 20 years. Rodriguez wrestled 4 years on varsity for Wayne Hills High School where he was 3x All-County, 3x All-Conference and a 3x Regional Qualifier. He went on to wrestle for Division III powerhouse The College of New Jersey (Trenton State College) which was ranked in the top five all four years of his career. Rodriguez has also been involved in mixed martial arts and Brazilian Jiu Jitsu for last 10 years, coaching and training martial arts competitors. Since 2012, Rodriguez has been coaching youth wrestling and lead the Hurricane Wrestling Program in Burlington. Now living in Raleigh, Rodriguez has been coaching with the Junior Wolfpack wrestling program. Coach Rodriguez is currently a college professor at an International Business School, Skema, located at NC State University. His two sons, Alex, 9, and Marco, 6, are currently wrestling. Wolfpack Wrestling Club and Wolfpack Olympic Regional Training Center practices take place at the Weisiger-Brown Athletics Facility on the the campus of NC State University. This facility houses the wrestling training facility, weight training and cardiovascular facilities, as well as a sports medicine and therapy room. "Wolfpack" is a registered trademark of NC State University. Wolfpack Wrestling Club, Inc. is a separate entity and has been granted permission by NC State University to use the trademarked term.